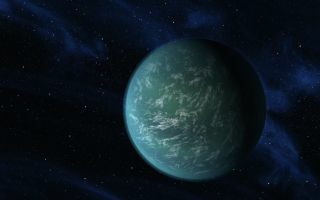 This artist's conception space wallpaper illustrates Kepler-22b, a planet known to comfortably circle in the habitable zone of a sun-like star. It is the first planet that NASA's Kepler mission has confirmed to orbit in a star's habitable zone -- the region around a star where liquid water, a requirement for life on Earth, could persist. The planet is 2.4 times the size of Earth, making it the smallest yet found to orbit in the middle of the habitable zone of a star like our sun. Scientists do not yet know if the planet has a predominantly rocky, gaseous or liquid composition. It's possible that the world would have clouds in its atmosphere, as depicted here in the artist's interpretation.